The River Town Program provides resources to the small businesses, community organizations, and municipal governments in the towns in which it works. Listed resources are organized by audience. 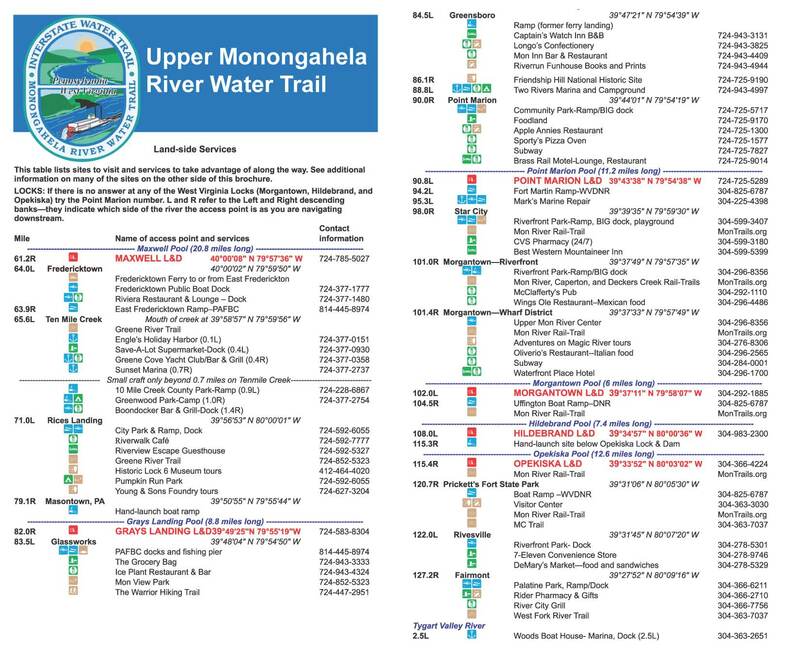 We have also listed helpful resources for planning river sojourns below. For Visitor Resources, including brochures, an outdoor recreation guide, and links to regional tourism agencies, click here. EPD in partnership with the Mon River Towns Program and most importantly California Borough worked for over five years to ensure an accessible, improved launch and docking facility was made available to the public. The project, funded by DCNR and the Borough of California was recently completed. 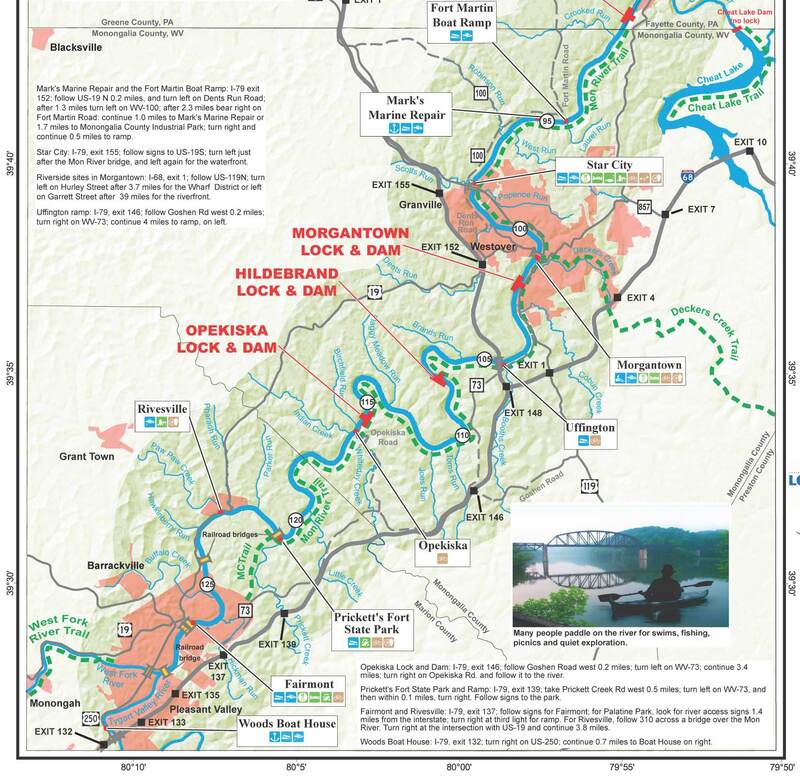 Locking through along the Monongahela River may entail different approaches. Some of the locks do not have floating cylinders as explained in this outlined procedure and instead require ropes from lockmasters. 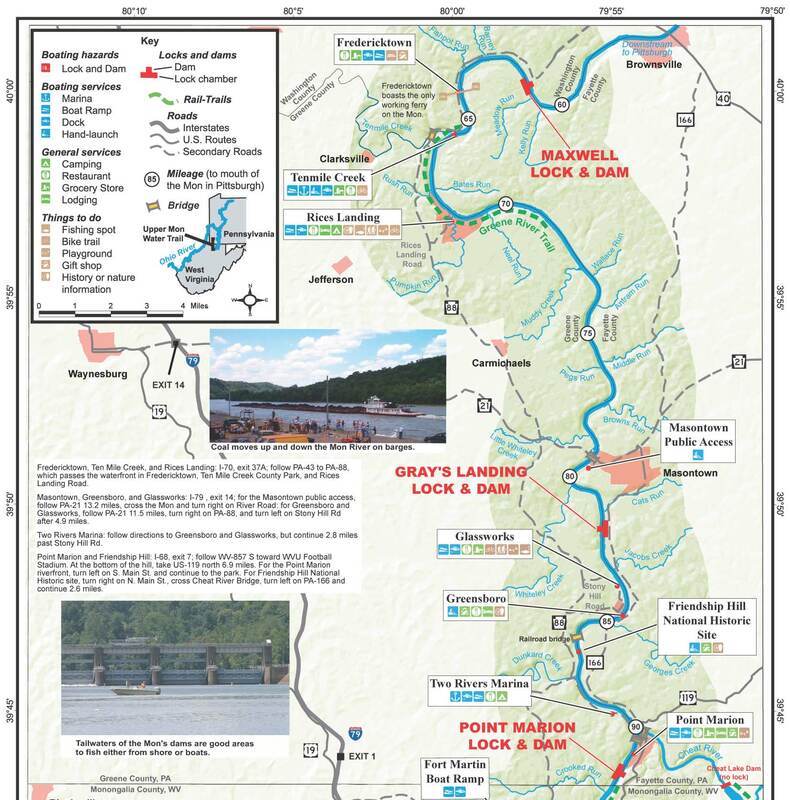 We recommend checking with the Army Corps of Engineers prior to planning a paddle that requires locking through. Remember though the pools of the beautiful Monongahela River offer great paddles without locking through. Organization of river trips and other social outdoor recreation. Promotion of safety and improvement of skills through organized instruction. Promotion of river conservation and recreational access. Exchange of information relevant to paddlers, such as river guides, trip reports, equipment ideas and safety advice. Dynamic Paddlers specializes in adaptive kayak instruction for people with disabilities and their able-bodied family and friends. Increasing awareness and engagement with the Pittsburgh region’s rivers and riverfronts through activities, stewardship, and expansion of water and land trails. Keep the Locks and Dams on the Allegheny River Operational and secure by seeking the necessary funding. Maximize the Hours of Operation of the locks for ALL users. Promote River Recreational Boating and to lobby for equal representation in governmental spending. Promote Commercial Navigation by keeping the navigable channels open and secure. Promote Economic Growth as it pertains to Recreational and Commercial Navigation in the communities that border the Allegheny. We strive to promote the great outdoors and rich heritage of southwestern Pa through the annual events listed below. Greene Cove Marina has been under the same family management since 1973, and has grown into one of the largest and most desirable family oriented, full service marinas along the Monongahela River. A true destination marina, Greene Cove offers plenty of amenities and activities for your family to enjoy. Offers some of the most spectacular natural scenery, outstanding outdoor recreation venues, historic sites & attractions, family activities, and world-class resorts. At its heart, POWR is a membership organization. As a network of local watershed groups advancing protection and enjoyment of Pennsylvania’s watersheds, we connect and build capacity, support and shared values among our members through various services. The Pennsylvania Land Trust Association seeks to protect Pennsylvania’s special places and landscapes for all generations to come. To increase the quality and pace of land conservation, PALTA helps conservation practitioners improve their work. Membership: N/A can sign up for account on their website.